CarGurus has 26,175 nationwide Expedition listings starting at $1,200. When even a full-size crossover just won’t do, check out Ford’s 2016 Expedition for your family-hauling needs. This full-size, truck-based SUV seats 8 in 3 comfortable and roomy rows, boasts all kinds of standard bells and whistles, tows up to 9,200 pounds when properly equipped, and comes with a turbocharged V6 powerplant (but not the V8 of previous generations). Better yet, this burly SUV looks the part of a load-leveling trailblazer. Available once again in trims ranging from the base XLT, to the well-appointed Limited and western-oriented King Ranch, and topped by the flagship Platinum, the 2016 Expedition is expected to return in 2 sizes. The standard length, with a 119-inch (9.9 feet) wheelbase measures 206 inches (17.2 feet) of overall length, and the EL version, which stretches the wheelbase to 131 inches (10.9 feet) has an overall length of 220.8 inches (18.4 feet). The standard-length variants offer 108.3 cubic feet of cargo area with the rear seats folded, while the EL editions boast 130.8 cubes of total toting territory. Of course, all versions of the truck-based 2016 Expedition will be delivered with standard rear-wheel drive (RWD), while each trim remains eligible for an off-road-ready 4-wheel-drive (4WD) configuration boasting auto-locking hubs and a 2-speed transfer case. As mentioned, the only powerplant available to the 2016 Expedition lineup is a 3.5-liter turbocharged V6 that debuted for the 2015 model year. Mated with the returning 6-speed shiftable automatic transmission, this force-fed 6-cylinder puts out a hefty 365 hp and 420 lb-ft of torque, to the tune of 16 mpg city/22 highway/18 combined in the regular-length RWD trim. Should you choose a regular-length 4WD trim, look for an estimated 15/20/17. The EL variants, meantime, run 15/21/17 with RWD, and 14/20/16 in 4WD iterations. 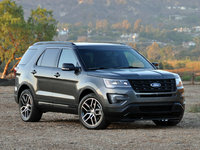 Standard bells and whistles in the 2016 Expedition stable are expected to mirror the current lineup, with a tweak here or there possible as Ford gears up for the next model year. As things stand—and depending on the trim selected—look for lower trims to sport 18- or 20-inch alloy wheels, a roof rack, and step running boards outside. Cloth upholstery, heated power-adjustable front seats, heated rear seats, full power accessories, cruise control and telescoping tilt-wheel steering adorn the interior. A backup camera, front and rear parking sensors, a remote garage door opener, and power-folding exterior mirrors also come standard, as does air conditioning and Bluetooth-interfaced SYNC/MyFord Touch infotainment with smartphone apps. A single-CD player with 6 speakers, satellite radio, and auxiliary audio input remains standard in lower trims, while higher-end editions boast a Sony premium stereo featuring 12 speakers and HD radio. Additionally, the 2016 Expedition Limited, King Ranch, and Platinum variants boast a standard power-opening liftgate, with the King Ranch adding unique western-themed trim accents inside and out, including genuine wood grain cabin adornments and ventilated front seats. The flagship Platinum, meantime, throws a standard power sunroof into the mix. All trims except the XLT return with standard dual-zone automatic climate control, an 8-inch monitor, and a voice-activated navigation feature (via SYNC/MyFord Touch). As is traditional in this hulking ute, lower trims remain eligible for optional equipment that comes standard in higher trims. These extra-cost add-ons include a remote engine start, second-row captain’s chairs (for 7-passenger seating), a load-leveling suspension with adaptive dampers, up-sized and upgraded wheels, and rear-seat video entertainment. Standard safety equipment aboard all 2016 Expedition variants, besides their domineering size, includes 4-wheel antilock brakes, traction and stability control, front side-mounted airbags, 3-row head airbags, front fog/driving lights, and a post-collision safety system. Again for the upcoming model year, a remote antitheft alarm, as well as Ford’s programmable MyKey teen-oriented speed and audio limiting technology, returns standard for the entire lineup, while the Limited and higher trims again boast the standard Blind Spot Information System (BLIS). Again for the upcoming model year, this hulking heavyweight is expected to sport a 5-star overall safety rating from the National Highway Transportation Safety Administration (NHTSA). Perhaps the only issue owners might have concerning their choice of this oversized highway- and terrain-tamer is finding a parking spot to stash it, not to mention getting it in (and out) of that spot. 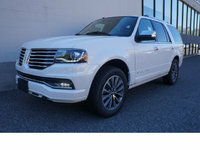 When it goes on sale in the fall of 2015, look for the 2016 Expedition to go up against such historic rivals as Chevy’s Suburban and its GMC Yukon cousin, as well as Toyota’s capable Sequoia. 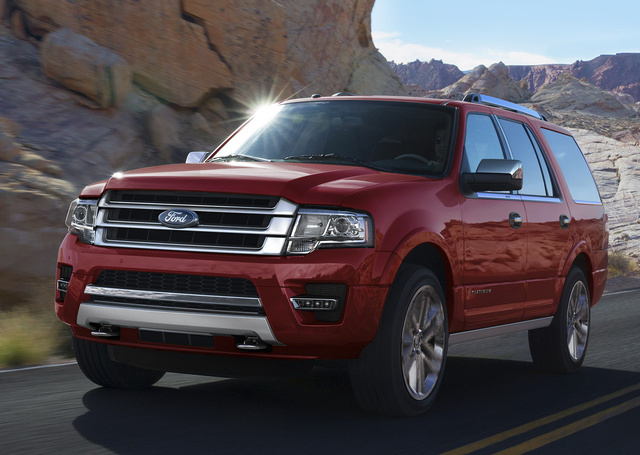 What's your take on the 2016 Ford Expedition? Users ranked 2016 Ford Expedition against other cars which they drove/owned. Each ranking was based on 9 categories. Here is the summary of top rankings. Have you driven a 2016 Ford Expedition? How Do I Use Pricing Tool?